Good morning, Atsushi. How are you today? I’m from Japan; I live in Tokyo. I understand that you are a big baseball fan. Why are you such a big baseball fan? Baseball is the most popular sport in all of Japan and my company, Orix, is the majority owner of a team in Japanese baseball. What is the name of the team that your company owns? There were two teams in the past, the Orix BlueWave and the Osaka Kintetsu Buffaloes. They merged teams in 2005. The Buffaloes were the first team to have an American player in 1959! How many teams are there in Japan? There are two leagues, the Central and the Pacific. Each league has six teams and the best team from each league plays in the championship, much like American baseball. Today in Japan! Today is actually tomorrow already in Japan…Saturday! The season begins at the beginning of April and ends in October. There are 140 or 144 games in the season! Can you watch the games from Denver? I check the results by Internet but I can’t listen or watch them on TV. I have to check, but I think Orix lost the first game unfortunately. I know that some players from Orix have come to play in the US. Who are those players? Ichiro (Suzuki) now plays for the Yankees and (So) Taguchi played for the Cubs, Cardinals, and Philadelphia. Hideo Nomo. Shigetoshi Hasegawa played for the team near Disneyland…the Angels? Yes, the Angels!!! He is retired now. All of these players played for Orix? They were very successful in American baseball; is Orix known as one of the best teams in Japan? We won the championship 17 years ago, so now we are a bit weak but we’re on the way up! Let’s discuss a few things about American baseball. Have you been to a game in the US? No, not yet, but I have toured Dodger Stadium in Los Angeles. It was about 17 years ago when I was in college. I am going to visit New York and go to Yankee Stadium next month! I will stay there three days and go to see a baseball game. I don’t know whom they play but I will go. You could also see the Mets because there are two teams in New York. Yes, I could see a New York derby! Who is your favorite US team? Hmm… it’s a difficult question. I like the Yankees but I stay here…so…Colorado! When do you plan to go to a Rockies game? I hope to go next week; the first home game for the Rockies is next week! I am very excited! It is very exciting for me! Who is the most popular team in japan? The Yankees…yes…the Dodgers, Red Sox, Cubs a little, and Seattle definitely. Ichiro played first with the Mariners (Seattle). San Francisco too. Derek Jeeter! I really like Hideki Matsui he played for the New York Yankees. He and I are the same age. Who did he play for in Japan? He played for the Yomiuri Giants in Japan. Where do the giants play? In Tokyo and Orix is in Osaka. When I was in elementary school, I played baseball and I was a catcher. Catchers are the strongest players on the field! How long did you play? Yes! I played four years. Who is your favorite catcher? Mike Piazza, yeah, Mike Piazza, he played for the Dodgers. He was very famous in Japan, because, you know Nomo, he played with the Dodgers and Nomo and Piazza were a good combination. It’s a difficult question. I’m not sure. What’s your favorite memory of baseball? Hideki Matsui got the World Series Most Valuable Player Award in 2009 and I felt really happy, it was a proud moment for Japan. I want more American players to come to Japan. I want there to be a good relationship between the US and Japan more and more. My dream is to have a Japanese manager for a US team. In Japan, some American people have become mangers of Japanese teams and I would like to see a Japanese manager in the US. I think there is a good possibility of that happening sometime soon. Thank you for taking the time to speak with me this morning, Atsushi. 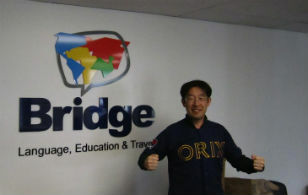 esl-blog baseball, Japan, opening day. permalink. Study at an American University: Conditional Admission Can Help!